Face lift surgery, also known as a rhytidectomy, is a type of plastic surgery performed to improve the appearance of the face. During the procedure, excess skin or fat may be removed. Remaining tissues are lifted and contoured to provide a younger and rejuvenated appearance. Most face lift patients choose this procedure to counteract the signs of aging, such as sagging and wrinkled skin. You may be a good candidate for a face lift if you are between the ages of 35 and 65 and have started to notice visible signs of aging such as facial lines, wrinkles, sagging skin, and deep facial folds (laugh lines). Facelifts results are best on those who still have some skin elasticity remaining. As we age, our skin naturally becomes less elastic. For this reason, patients who are over 65 may not achieve the results they desire, although many patients of this age have had successful outcomes. Prospective patients should be realistic about the results a facelift can achieve. This procedure cannot make you look like an entirely different person, but it can turn back the clock on some of the signs of aging. In general, facelift patients must be in good overall health and are at or near their ideal weight, although they can be performed on those who are moderately overweight. Most face lift techniques focus on the lower areas of the face, such as the jawline, jowls, and cheeks. Some facelifts can also focus on the middle of the face or the forehead. If you wish to focus extensively on the upper portion of the face, a forehead lift or brow lift may be the better option for you. A typical facelift takes two or more hours depending on the extent of the procedure and the technique used by your plastic surgeon. The procedure is performed in a hospital or state accredited surgery center on an outpatient basis and patients are given general anesthesia. The following is a basic overview of how a facelift procedures are performed. The incision line is hidden in the scalp. It starts at the temples and continues around and behind each ear (incisions are made without clipping or shaving hair at the incision site). After making the incision, the surgeon raises the skin from the temples, cheeks, and neck. Then, your surgeon lifts and repositions the underlying connective tissue and removes excess fat and skin. Finally, the surgeon redrapes the skin over the new underlying structure and closes the incisions with stitches and small metal clips. Drainage tubes are inserted and bandages are applied. If this procedure is performed in conjunction with a neck lift, a small incision is made underneath the chin. The neck muscles are drawn together and stitched together at the middling forming a strong sling of muscles that supports the entire neck and jaw. Before moving forward with face lift surgery, be sure you fully understand the potential risks associated with the procedure. Facelifts are typically performed with general anesthesia. As the anesthesia wears off following your surgery, you can expect to feel tired and groggy. 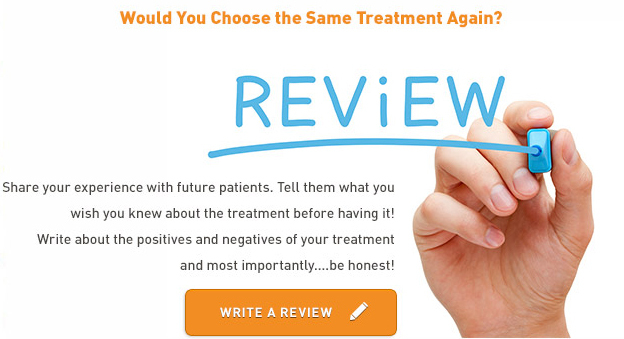 Many face lift recovery patients also report feeling confused or nauseous. Patients usually return home on the same day as their facelift procedure. You will need to arrange a ride home from the surgical center. During this initial facelift recovery period, you can expect to experience some bruising, swelling , and tenderness. The bruises may extend to the eye area, giving you the appearance of a “black eye.” Any discomfort you feel can be controlled with pain medications. Other common face lift recovery side effects include temporary numbness and tightness as the tissues heal in their new positions. You may have sutures or tape holding the incisions closed as they heal. During this time, avoid disturbing the incisions or the facial tissue. Patients are advised to wear button-down shirts during the facelift recovery period. Sleep in an elevated position with several pillows behind your back to reduce swelling and other side effects. Be gentle to your face; avoid vigorous scrubbing, brushing or blow-drying your hair, or other activities that may irritate the tender skin or the incisions. During this time, it is also important avoid alcohol consumption or hot saunas. DID YOU HAVE A FACE LIFT? Because face lift surgery requires incisions in the skin, there is a possibility of scarring. Most incisions are located in areas unlikely to result in visibly noticeable scars, such as behind the hairline or just in front of the ear, although patients should understand that scars are possible following a facelift. Any scars that you do notice should fade into the surrounding skin over the next six months to a year. Avoid medications that may interfere with swelling and fluid balance. 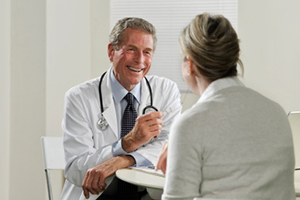 Tell your doctor about any medications you are taking. 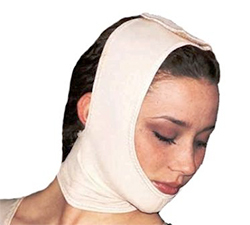 Depending on the areas targeted by your facelift procedure, the treated area may be wrapped with surgical gauze, bandages, and/or a compression garment following the surgery. Care for the treated area as advised by your doctor. If a compression garment has been recommended, wear it as often as possible, including full-time for at least the first few days. Following surgery, a compression garment controls swelling and holds the tissues close to the body, helping them to adjust to their new contours. Loose skin, held closely to the body with compression bands, is less likely to sag or wrinkle as it heals. Facelift healing time is typically between one and three weeks. Patients spend the first few days recovering from surgery before gradually returning to their normal activity level. Most face lift recovery patients return to work in a week to ten days, depending on the extent of the procedure. Avoid strenuous activities for at least a month. Although the initial recovery period takes just a few weeks, you can expect the final results of your facelift to be visible in about three to six months. The results of a facelift are permanent, although the face will continue aging naturally following the procedure. Most patients experience visible results for between five and ten years following their surgery. The average surgeon’s fee for a face lift is about $5,000. However, this amount does not include anesthesia, the operating room, or other costs, which can bring the total cost closer to $6,000 to $9,000 with more extensive procedures being around $15,000. Typically, the facility fee is between $500 to $2,000 and the cost for anesthesia ranges from $1,000 to $1,200. There may also be some other miscellaneous expenses, such as medications and post-surgery care needed during the recovery period, that may not be included in the above fees. When asking your surgeon about the cost, always make sure that you’re getting the total cost, not just the surgeon’s own fee for performing the surgery, so that you’re not surprised by these charges later on. Although the types of fees charged for facelift procedures are the same, the amount of these fees can vary greatly from patient to patient, making it difficult to generalize an overall cost. The first variable is your location. Those in large metropolitan areas tend to pay more for cosmetic procedures than those in smaller locales. Even within the same city, different facilities may have varying fees. 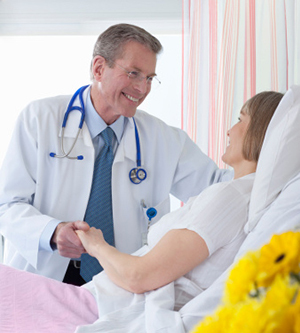 In addition, the plan for your surgery itself also has a significant affect on its cost. In general, longer or more complicated procedures are more expensive than less complicated ones. A mini facelift or “weekend facelift” is typically less expensive than the full facelift, although it may not produce such dramatic results. On the other end of the spectrum, some patients combine facelifts with other cosmetic treatments. Although this can result in a higher cost, it is often much less expensive than to have each of the procedures performed separately. Most patients return home the same day as their procedure, however if an overnight stay is required this can make your cost even higher. Finally, the surgeon you choose will significantly impact the cost. Plastic surgeons who are board certified and highly trained, with many years of experience are able to command higher prices than less qualified surgeons, but this additional expense can be well worth it. An experienced surgeon can help ensure that the most appropriate surgical technique is used for your face lift procedure, increase the odds of a successful outcome, and reduce the risk of complications. Always remember that plastic surgery is as much an art as a science; select a surgeon who you feel will be able to sculpt your face in a way that you will be happy with. Never choose your surgeon based on cost alone, or you may end up regretting the decision. Because facelifts are considered cosmetic procedures, they are not covered by insurance. However, don’t let the price be the only factor dissuading you from moving forward. Today, many facelift surgeons offer affordable financing options such as monthly payment plans. By spreading the full cost over several years, it is possible for facelifts to finally fall within your budget. If cost is a consideration, ask your surgeon about the availability of financing during the consultation visit.